First - Happy Canada Day! Second, I'll be turning 40 pretty soon and it got me thinking about the phrase "middle age". It's always been my observation that life is "speeding up". When I was a kid, the time between Christmas from one year to another seemed to take an eternity. Yet now, I struggle to remember that 1993 wasn't 9 years ago, but 19! What's going on? My theory is that we are terrible at tracking time. Instead we can track "relative time". When we are six years old, the time from one Christmas to the next is fully one sixth of our lifetime - in fact, given that, at age six, we may not have any memories earlier than age three, we could conclude that each year is fully a third of our existence. However, once we reach age 40, each year is only a sliver of our total existence, and thus seems much smaller. This seems to be the only reasonable explanation of where my 30s went in a blink of an eye. Let's first look at the cumulative chart. This example takes the relative age for each year. By measuring the areas under the curve we can determine the age of equal "relative age", or the ranges of ages which should "feel" the same period of time, taking into account the apparent acceleration of the years. 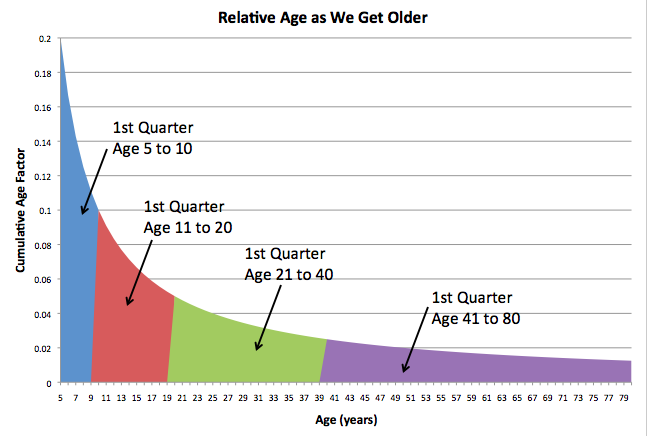 This shows that the first quarter of our life is over by age 10, the second by age 20, the third by age 40, and the last quarter, by age 80 (which, if you think of the math, makes perfect sense). If I think of my childhood, this also feels right as well. My teenage years, which technically lasted as long as my 30s, were a lifetime! My 30s, I believed, happened when I went out for lunch one day. So, the horror that we can realize is that 40 is not middle age - 20 is! 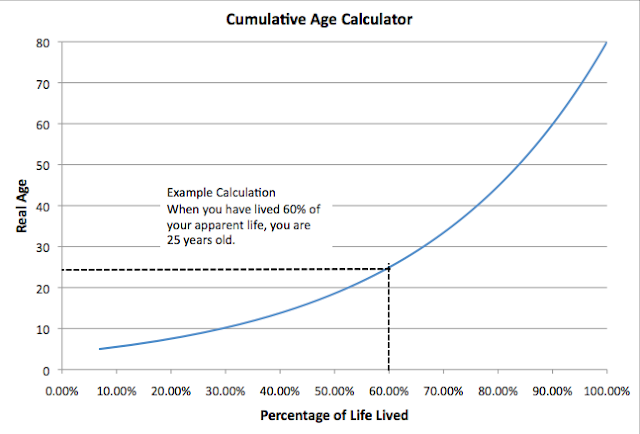 By the time you reach 40, you've lived fully 75% of your apparent life timeline. Even though you are halfway through your life, the remaining years will seem like the blink of an eye. This lets us determine what age corresponds to the percentage of apparent life lived. 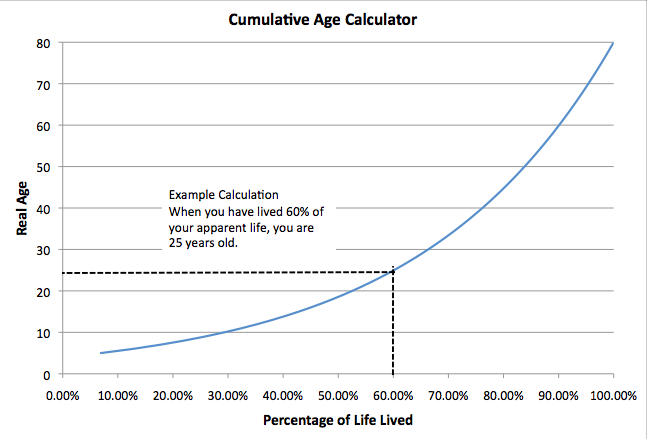 For example, as shown, the age at which you have lived 60% of your perceived life is actually 25. On one hand, this is a clear call to enjoy your youth, on the other hand it shows that we've all been given the gift that our youth lasts a disproportionately long period of time - which is great if you had a good youth, not so great if you didn't. Now, interestingly enough, these results are driven by the assumption that you have perfect memory of your life, and thus each minute seems progressively quicker than the minute before. This leads to some interesting conclusions. The first is that there is a real cost to memories - their cumulative effect serves to make your life appear to go quicker. So, if at all possible, there's little point fixating and hanging on to bad memories. Relieving them serves to slow down the perceived acceleration of time. As well, there is possibly the saving grace that, as you age, your memory of earlier events starts to diminish. This will put more relative weight in the later years and appear to slow time down. Looking at the first graph, if you were able to forget the first 10 years of your life completely, then the effect is dramatic on shifting the relative weights of the later years. Is it possible that there is some benefit to dementia and memory loss in your later years? I doubt the benefits outweigh the dramatic costs, but it's an interesting thought. This also leads to some conclusions about kids. As I watch my kids grow up, I get to experience, vicariously, their experiences. While overall life is zipping by for me, and they are growing up at an incredible rate (from my point of view), they also help to slow my life down by providing an external reference point to my life. Time dilation may be part of Einstein's theory of relativity, but its also alive and well between two people at dramatically different points of their life. So, as I round out the first 75% of my life, and I see that we are almost in 2015, the year at which Back to the Future will be as far from me as 1955 was for my Dad when the movie first came out in 1985 (and led him to say that he felt old! ), I can really question the phrase that "life begins at 40". If it does, then life sure felt like it took a long time getting started. Enjoy every moment that you live, and savor every good memory you have. Even if you live to 80, you're just not here very long. It's always nice to get some press from MIT. Here's a recent story they did on Energy Cache. A lot of venture money was raised in the late 90's, before the burst of the first internet bubble (2001). There has been a lot of talk [citation needed, but I can't find right now] that, since most VC funds are 10 years in duration, we would see a great VC contraction sometime around 2010. In fact, I had a list of firms that hadn't made any investments in years, and I haven't gone back to check if they are still around. However, anecdotally, I have witnessed a contraction of another sort. Good firms, that are still around, losing good partners. As I've been speaking to investors lately, I've discovered no less than sixnine different partners that I knew personally, mostly senior, from very good firms, have moved on. They have all taken senior operating roles with technology companies (no surprise, as that is the typical path in and out of VC), but what's interesting is that this seems to be more than the typical gas diffusion mechanic between VCs and tech companies. What does this mean for the investing landscape, and how those firms operate? I'm not sure, but I'll certainly be watching. Energy Cache was written about recently in a posting on Earth2Tech. The source of that post was the recent Wall Street Journal’s Eco:nomics conference where Bill Gates commented on a company that he was involved with that was doing “gravel on ski lifts.” Also, included was a link to our patent and our operational video. I'd like to comment on a few of the things mentioned, and not-mentioned, in the article. Energy Cache's design philosophy, from the company's founding, was that energy markets want minimal technology risk. This has been my experience starting with my early engineering career developing fuel cell technology, to my more recent experience as an investor in solar companies. In both those cases, the technological unknowns were the least appreciated by the established, conservative, market. While Energy Cache has made impressive technological developments, we developed the technology so that we could, as much as possible, co-opt the existing expertise, supplier base, and operational knowledge from existing industries and use them to solve the problems that we wanted to address with energy storage. This is how our small team has been able to design and construct our 50kW installation on impressively efficient schedule and budget. The difficulty, for current technologies, as stated in the article, is siting and permitting times. Pumped hydro needs two large reservoirs; compressed air energy storage (CAES) requires an underground cavern that doesn't leak (the efforts of "above-ground" CAES solutions excepted). At the recent ARPA-E Summit, Secretary Chu stated that "geologic solutions" would be necessary going forwards, regardless of the current siting and permitting difficulties. This is a view echoed by Pike Research. However, one of the pieces of brilliance in Energy Cache's approach comes from the fact that we will likely not experience the same siting and permitting difficulties of pumped-hydro and CAES. This comes, in part, from the flexibility achieved by using a low-cost base unit. A typical pumped hydro facility consists of a single, or very few pumps/generators (PG&E's Helms Pumped Storage facility consists of three 400MW turbines, for a total of 1.2GW). This is the only way to make either the technology, or the economics, work - build at very large scale. In doing so, such installations become very difficult to find appropriate sites for. Energy Cache's system deploys many units and can be far more flexible in terms of economic operating size. Therefore, we have already found a tremendous number of sites suitable for our more flexible technology that would be inappropriate for CAES or pumped hydro. In addition, we have several other benefits, which I won't discuss here, that we expect to greatly reduce the permitting difficulties that have previously been mentioned. The article says that "Terrestrial storage isn’t cheap." This is true in absolute terms, due to the size of these projects (as mentioned above). However, on a kW or kWh basis, pumped hydro storage and CAES are among the cheapest technologies currently known, as listed in EPRI's Energy Storage Report, page 4-22. Pumped-hydro storage is the de facto storage solution that every utility would like to deploy. We believe, and this is backed up by the data, that Energy Cache will have a compellingly competitive cost structure as compared to these technologies. In addition, Energy Cache has solid data that demonstrates that we will be one of the highest revenue earning storage technologies possible. This puts us in a class of our own in terms of potential profitability. With a substantial number of operating sites identified, extraordinary economics, a rapid path to market, and the backing of some extraordinary investors and technology visionaries, I'm very proud of what Energy Cache has accomplished in such a short time, and where we'll be headed in the future.